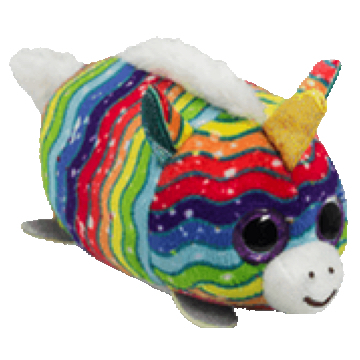 Star is a tiny unicorn covered in a wavy rainbow pattern. She has purple glittery button eyes and a white muzzle with a black embroidered mouth and nostrils. Her tiny feet are sparkly silver and she has a fluffy white mane and tail and a shiny gold horn on her head. Star was released on 26th March 2019. Her Birthday is on 11th February. Star is part of the McDonalds Teeny Tys range that was released for the 40th Anniversary of the Happy Meal. There were twelve different McDonalds Teeny Tys released that were available free with each Happy Meal purchase, with each Teeny Ty having three different colour variations, making a total of 36 to collect. The Teeny Tys were also available for purchase without having to buy a Happy Meal. The three variations of Star are this white mane version, a purple mane version, and an orange mane version.